György Ligeti is widely associated with various modernist movements in 20th Century music. Although he was influenced by a number of composers and their ideas, he tended to follow his own path producing music which often sounded unique and defied classification. He was born among the Hungarian population in the Transylvania region of Romania, and studied at the conservatory in Kolozsvar. The Nazi occupation interrupted his studies and being Jewish, his family were all sent to concentration camps. Although many of his relatives died in Auschwitz, Ligeti was able to resume his studies after the war. He then taught for a time at the Franz Liszt Academy in Budapest. Communism was then the dominant political force in this part of the world, and when the Russian army quashed the Hungarian Revolution, Ligeti fled to Austria (hiding with his wife aboard a mail train to cross the border) and then settled in Vienna. There he was to have greater interaction with other western composers and his musical style developed and evolved over a number of decades. Ligeti studied all the usual aspects of compositional theory and practice, and also studied Romanian folk music. His early piano works seemed to have been influenced by the piano music of Bartok, a fellow Hungarian. While in Cologne, Ligeti dabbled for a while with electronic music alongside Karlheinz Stockhausen, in an electronic music studio owned by a German radio station. Then his most extreme exploration of the avant garde world was the "Symphonic Poem for 100 Metronomes" which are set ticking at different rates until, one by one, they wind down. However Ligeti's music soon settled into an exploration of the music of evolving textures using first orchestral forces and then voices, and it is this style of music for which he is best known. Ligeti himself coined the term "micropolyphony" to describe it. His "Atmospheres" for orchestra exemplifies this soundscape idea, and it caught the attention of Stanley Kubrick among others. The director was to use the composer's music on no less than three of his films, although 2001: A Space Odyssey is the best known for its "other worldly" sound courtesy of Ligeti (although the composer was not contacted to obtain permission for this use). In some ways Ligeti's music turned full circle when in later years he concentrated more on the kind of textures which could be created using mixes of different rhythms rather than polyphony, and this led him to study the techniques used in World Music in general and African rhythms in particular. 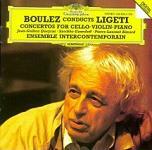 After a number of years of ill-health, Ligeti died on 12th June 2006. A performance of his "Symphonic Poem for 100 Metronomes" poignantly concluded a concert given after his funeral in Vienna. Musica Ricercata - also for piano, and was used in the film "Eyes Wide Shut"
2010 - (the sequel) also uses "Lux Aeterna" and of course Strauss's "Also Sprach Zarathustra"
The "Gyorgy Ligeti Edition" is the most comprehensive collection of recordings of Ligeti's music. Here are selected items from this collection, and other recordings which are sure to be of interest.